Metabo HPT, formerly known as Hitachi Power Tools, made its North American debut by launching a MultiVolt platform that enables users to choose either cordless or corded operation without sacrificing portability, power or performance. Metabo HPT’s MultiVolt tools can accept a 36V battery or plug into an outlet with an AC adapter. When using the MultiVolt AC Adapter, one can use the tools with long extension cords or from a generator with little to no power loss thanks to brushless motor technology. Because no one ever wants to change battery platforms, the 36V MultiVolt cordless battery is designed to work with 18V tools. The battery delivers 4.0 Ah of runtime at 36V in MultiVolt tools, but it can also power Hitachi or Metabo HPT 18V cordless tools, including cordless nail guns for increased flexibility and multipurpose use. When the MultiVolt battery is used with the 18V tools, it generates an impressive 8.0 Ah of run time. Metabo HPT launched 15 MultiVolt tools and plans to add many more.. In North America, current Hitachi Power Tool products will begin to transition to Metabo HPT in January 2019. The products will retain current brand identity: same color, same model numbers, same warranties and the same battery interchangeability. 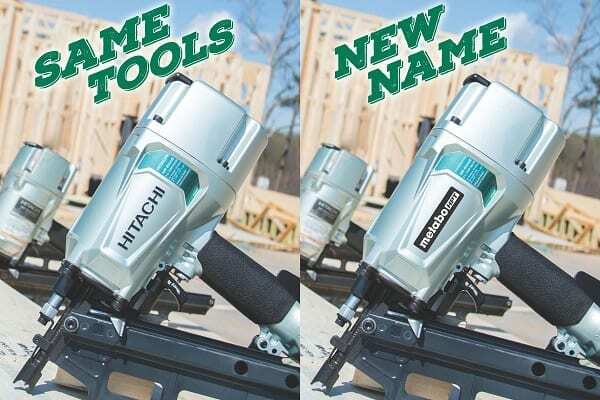 Metabo HPT packaging and signage at point of sale during the transition will feature both names and logos to clearly communicate the changeover from Hitachi Power Tools.